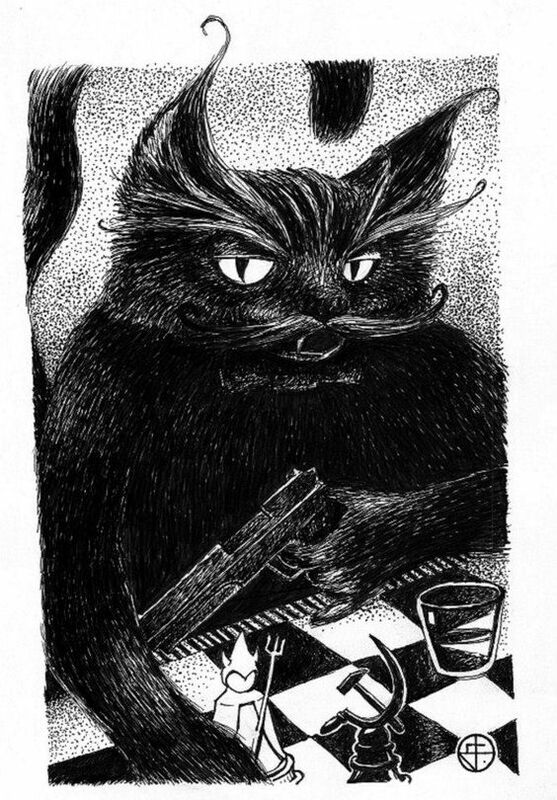 Behemoth is the cat-demon – ‘the size of a pig, black as soot, with luxuriant cavalry officer’s whiskers’ – in Mikhail Bulgakov’s dazzling, anarchic, ultimately joyous novel The Master and Margerita. He’s part of a Satanic retinue that descends on Stalin’s Moscow in the 1930s and creates subversive mayhem. For most of those whose path he crosses the results are disastrous: the description of the showdown between a pistol-packing, chandelier-swinging Behemoth and the secret police is an almost cinematic tour de force. But for a select few – the novelist ‘Master’, his heroically loyal lover Margerita and the poet Ivan – something positive comes out of the encounter with Satan and his entourage. On the book’s flyleaf Bulgakov quotes the words of Mephistopheles from Goethe’s Faust: ‘I am the power that always wills evil, but always does good.’ Behemoth’s mischief-making can also be strangely redemptive. I pictured him prancing onto the stage, waxed whiskers flourishing, for the novel’s Magic Show at the Moscow Variety Theatre. The opening idea for my Behemoth Dances came to me suddenly in St Petersburg in 2006, during a trip to Russia to do interviews for a radio documentary, Shostakovich: A Journey Into Light. It then sat on my desk for seven years. It was only towards the end of 2013, after the deaths of both my parents, that I found my ‘Russian’ idea beginning to play back in my mind again. Tentatively at first, this fused with long-cherished images of Bulgakov’s Behemoth. I pictured him prancing onto the stage, waxed whiskers flourishing, for the novel’s Magic Show at the Moscow Variety Theatre. Gradually my sketch began to change character: less fraught and driven, more playful, exuberant, naughty. It acquired a brief introductory ‘warped’ fanfare for trombones, with circus bass drum and cymbals. Like the Moscow Magic Show the music has a tendency to change direction abruptly. Soon after the opening a mock-panicky clarinet solo yields suddenly to an upbeat Hollywood theme on massed horns, followed by shrill laughter on woodwind. Later there are incursions from the world of Scott Bradley’s Tom and Jerry scores: Behemoth-Tom rapidly shaking his head (xylophone and woodwind), springing into the chandelier (glissando whoosh) and meowling derisively at the secret police (soprano saxophone and tom-toms). There are also echoes of 70s light music that drift in and out of the texture – rather like sampled sounds in contemporary electronic dance music. It was soon clear that the music had a momentum of its own: it seemed sure where it wanted to go. In keeping with Bulgakov’s Faust motto, a ‘sacred’ ingredient balanced the secular-satirical element in the form of two church plainchants: ‘Libera me domine’ (‘Release me, O Lord’) and ‘Lux aeterna’ (‘Eternal light’). These two chants proved remarkably fertile when it came to suggesting motifs and developments. At first they appear in distorted, parodic forms, but with time they regain something of their former eloquence and dignity. It was only later that it struck me that both chants came from the Requiem Mass. In the novel, the Master and Margerita are both in search of ‘rest’ (the meaning of the Latin ‘requiem’), but perhaps I was also thinking of my parents, whose own last years were difficult and painful. At the still heart of the piece the ‘Lux aeterna’ phrase sounds twice (solo bassoon and cello, solo flute and viola), above hushed, tender harmonies: a prayer perhaps for – in Bulgakov’s own words – ‘Absolution and Eternal Refuge’.